We are hearing quite a lot at the moment about budget deficits and the national debt, and doubtless this will intensify in the next few months. Our politicians have a habit of confusing the two and economists insist on expressing them as a percentage of GDP, so we can miss out on knowing what the magnitude of the debt really is. It was not always like this. Recently I came across a Lantern Slide that did not mince its words. I have no idea who originally owned the slide or for whom it was intended, but here it is. 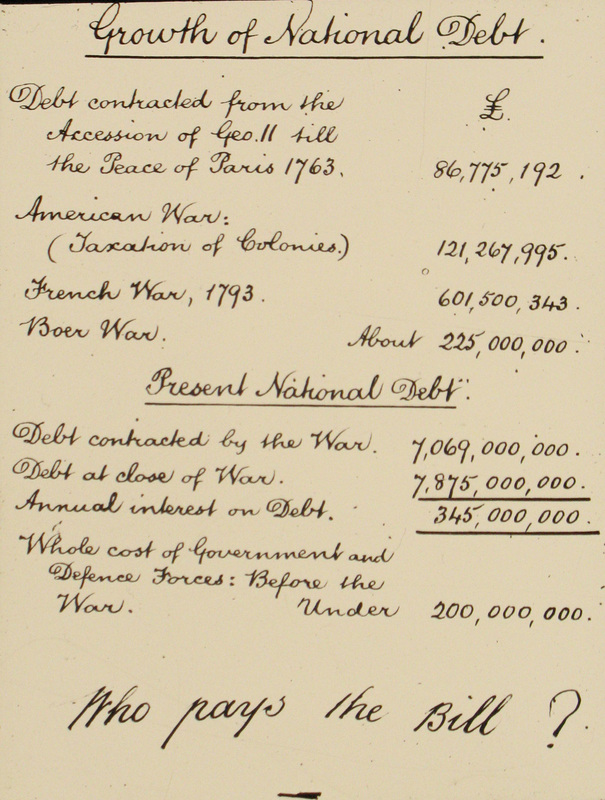 It shows the growth in national debt from 1727, the date of the accession of George11, then through three wars and finally the debt contracted by World War 1. The debt at the end of that war stood at – £7,875,000,000. Today, it stands at some £1,484,160,700,000, nearly1.5 trillion, and increasing at the rate of £5170 every second. This entry was posted in Odds and Ends on February 4, 2015 by John Sawkill. Fascinating and rather frightening to think that the WWI debt was finally repaid in December 2014! !